The five fundamental basics for successful pistol shooting. Aiming consists of two things: proper sight alignment and sight picture. Sight alignment involves aligning the top of the front sight level with the top of the rear sight blade or sight notch, with the front sight blade centered in the rear sight blade notch. If your pistol has dots on the sights don’t use them to align your sights as they are there to help you find the sights quickly when coming up on target. Once you have your sights properly aligned then focus on the intended strike point for the bullet and place the top of the front sight blade on the point of the target you want the bullet to strike. Then shift your focus back to the front sight and keep you focus on the front sight all the way through the shot. When you are focused on the front sight the target should be slightly fuzzy and your rear sight or sight notch should be slightly fuzzy. Proper aiming is one of the two most important shooting fundamentals. Hold Control is the method by which the body and the pistol are held as still as possible during the time when the shot is fired. Hold control is achieved by using a proper grip on the pistol, a balanced and comfortable shooting position, and a shooting position that is naturally aligned to the target. Good hold control is developed through physical fitness, muscle tone, and extensive practice so you can hold the pistol on target with a minimum natural arc of movement. Breathing Control is used to minimize the pistol movement due to breathing. As you breath your arms rise slightly with each breath inhaled and drop slightly when exhaling. In an unhurried shooting environment you can take a couple of normal breaths, exhaling about half the air, and then momentarily hold your breath as you press the trigger. However, if you hold your breath more than a few seconds then you will likely experience minor body tremors. If you aren’t comfortable getting your shot off within three or four seconds then relax and repeat the breathing exercise and then press the trigger. In a more rapid firing situation you simply cease breathing momentarily while the shot is being fired. Trigger Control is the other most important fundamental in pistol shooting. Good trigger control is the art of pressing the trigger without moving the front sight off target. This is perhaps the most challenging pistol shooting fundamental for most shooters. You must be able to apply even pressure to the center of the trigger as you apply a smooth press of the trigger until the pistol fires. The rearward movement of the trigger can’t be jerky and you can’t “slap” the trigger. A smooth trigger press leads to a surprise break of the trigger because you weren’t expecting the pistol to fire yet. The pistol needs to fit you hand with the right trigger reach and your index finger needs to be properly placed on the trigger. The reason trigger control is so challenging is you are attempting to hold a pistol that weights less than two pounds perfectly still through a trigger press that may take twelve pounds pressure to make the pistol fire. 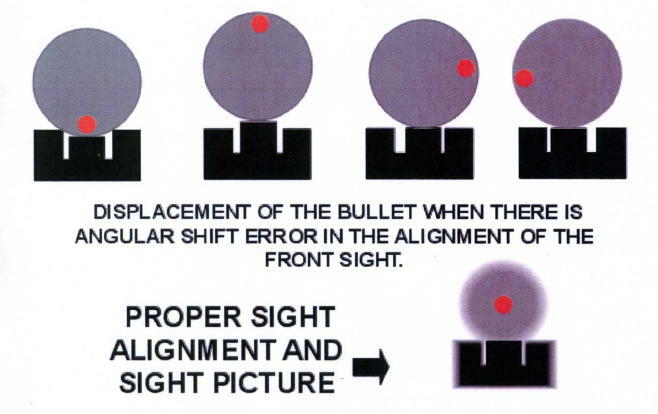 Poor trigger control can dramatically affect the strike point of your bullet. Follow Through is common in most all sports and equally important in shooting pistols. Follow through is the shooter staying focused on integrating and maintaining all shooting fundamentals before, during, and immediately after firing the shot. That means staying focused on the front sight through the shot and watching the front sight rise and then fall back on your aiming point so that you can make a follow-up shot quickly. Even if you aren’t making a follow-up shot you have to stay focused on the front sight until it drops back on target, then lower the gun and look to see where your bullet strikes your target. Otherwise you will subconsciously be starting to move the pistol downward as you press the trigger because your brain tells you to look for the strike point of the bullet the instant you press the trigger. If you are shooting multiple shots you don’t take your focus off the front sight until the string of multiple shots are fired then lower the pistol to see where your bullets struck the target. Failure to practice follow through causes you to consistently shoot low.